Last year I was asked what my favorite quote was. It was great timing because just the week before I had written this post about learning from the lower moments in life and included one of my mottos of 2013. There is a difference between quitting because something is hard and quitting when something is no longer working. In the case of the latter situation, you aren’t quitting per say, but allowing something that has already died to be dead and buried. However, when times are hard and you want to quit because it feels easier, stop and reassess your situation. A good rule of thumb when trying to decide if quitting is the right option is to ask yourself how easy it would be to quit. 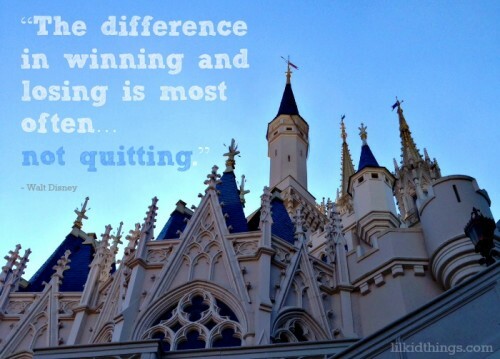 If quitting is hard, but you know you will be better off, it may be the right choice. If quitting is the easy option, you need to try harder. If quitting is the difficult but healthier choice, it may be the right answer. If quitting is the easy option, you need to try harder. I have been writing on this blog for ten years. In that time I have seen seasons of popularity and seasons when only my mom was reading (hi mom!). I have made connections, had jobs and written posts every day. I have had seasons where a week went by without a word. I’ve had supportive comments and judgmental comments. There have been times when I wanted to quit. Finishing is the same as winning! Oh it just made so much sense! As we race through our goals whether they be weight loss or a new physical feat or professional or spiritual, most often we aren’t competing to win. As I look back through the things I want out of life, I see that I have done it all wrong. I’ve attacked my goals with a spirit of competition rather than a spirit of completion. I want to finish. And I want to finish strong! What that means for me is I have to go at my own pace. I have to be ok with making choices and walking away from the projects that have died in favor of the ones that are still living, even hanging on by a thread! I have to allow for failure and welcome it as progress even when it doesn’t feel that way. Do you think that someone who walks the last mile of a marathon is any less worthy of a medal than the person who flies through the tape with a 6 minute pace? Did they not both finish? Please be encouraged if you are feeling weary. As I stepped on the scale 1.5 lbs higher than last week, I felt a moment of defeat. And then resolve. My goal is to finish what I start. And finish strong. It’s Friday and if you made it all the way to the end of this post, I am going to reward you with a little homework! The finish line is not going anywhere and if you don’t quit, you WILL get there. Are you stuck? Let’s fix that. Three things to do this weekend. Make a list of 3 things to celebrate about the past week. Take a photo of something that inspires you to keep going and tag it with #CelebrateTheRace – let’s encourage each other! I’d love it if you would share your lists here or on your own blog. As a selfish benefit, I will be using your inspiration as MY inspiration in these last two weeks before the Glass Slipper Challenge. I can promise you I will be needing all the finishing vibes I can get! And one more thing before you go, if you need some support and ideas on how to get back on track, check out my friend Erin’s new Take Back Me project! She already has a great community of friends and support so you can jump right in. How will you celebrate the race? Thanks for the shout out lady. I’m loving all the new ideas and support. And this post is EVERYTHING. It’s so easy for us to be dejected when you have a bad day and think about throwing in the towel. But we just need to get back on the horse the next day and try again. Thanks for the reminder to NOT QUIT. good vibes my friend! miss you! I miss you too! Wish you could hop in the van with me!